There isn't a lot to say about today. It was mostly domestic, though I did process three new listeners. John came over to see Rita and we walked up to Aldi, the furthest that Pauline has walked since she broke her ankle. 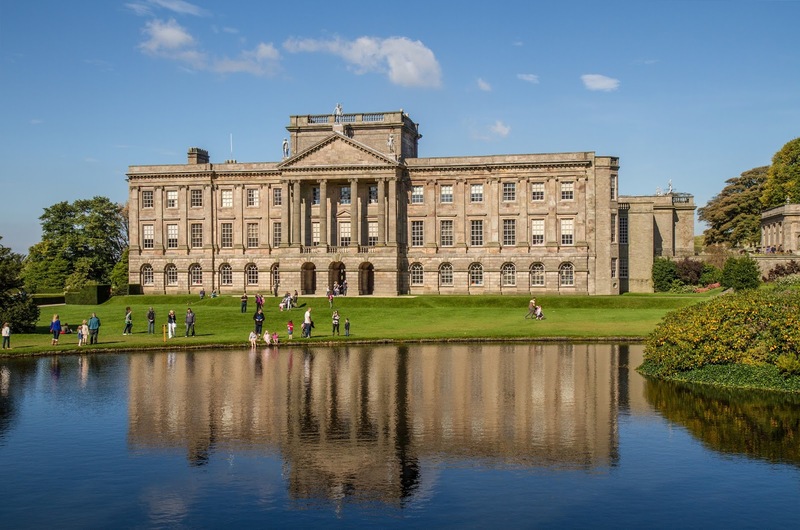 So now we move into Derbyshire, near neighbour to us in Staffordshire and home to the most beautiful stately home in the country. 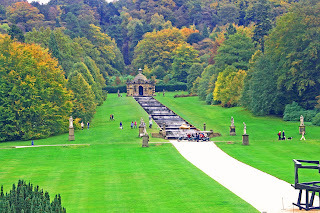 The approach to Chatsworth is very picturesque. 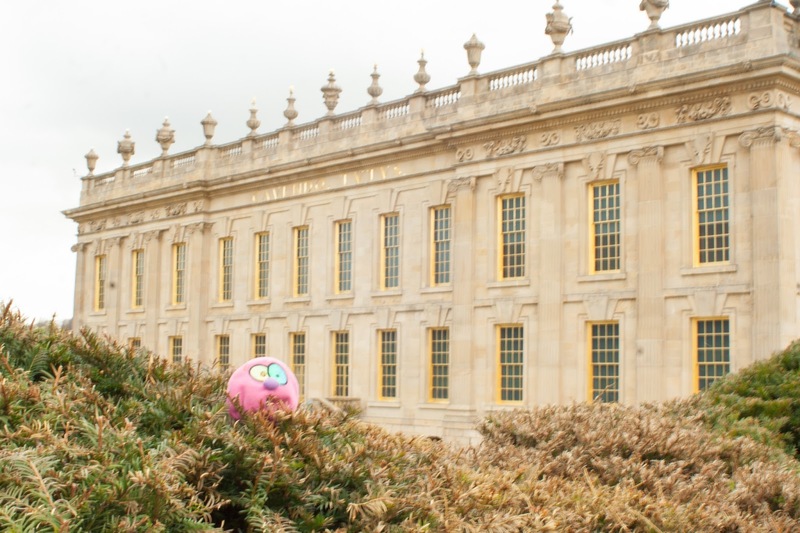 Chatsworth is not a cheap day out but don't let that stop you going. 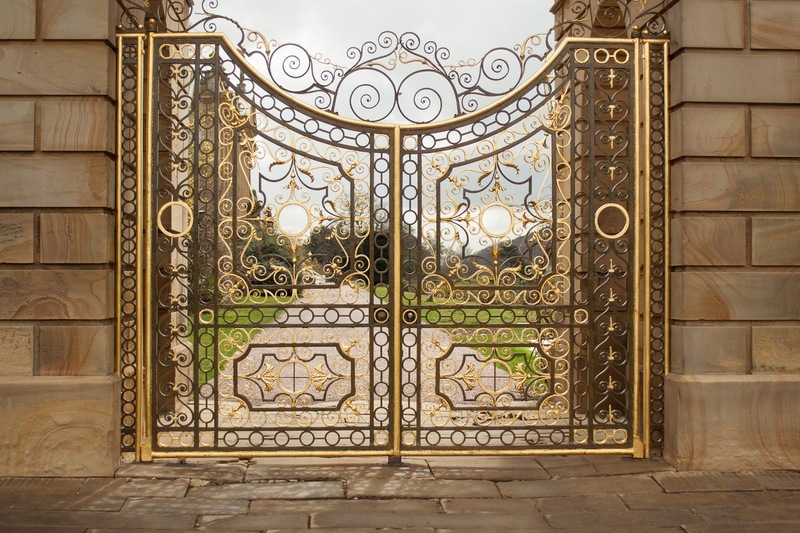 It is set in 105 acres of beautiful parkland and is one of the most opulent houses in Britain. The journey through the house is always interesting. 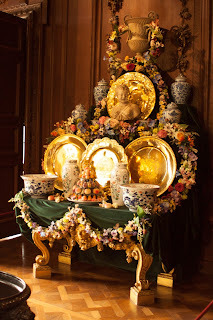 They are constantly working on rebuilding and titivating the gold leaf. The quality and workmanship throughout is breathtaking in parts. You can't use flash so to get really good interior shots you need a tripod or a very steady hand, so you'll have to go yourself to realise their full beautiful. 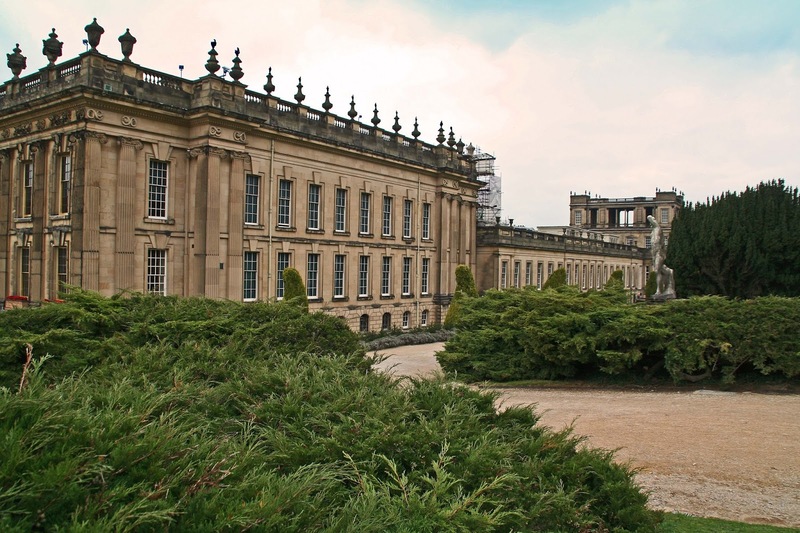 The house and estate date back to 1553 but the Earl of Devonshire took over in 1694 and the building of what is the Chatsworth we see today began. It would be doing Chatsworth a disservice to give too much away on this blog. 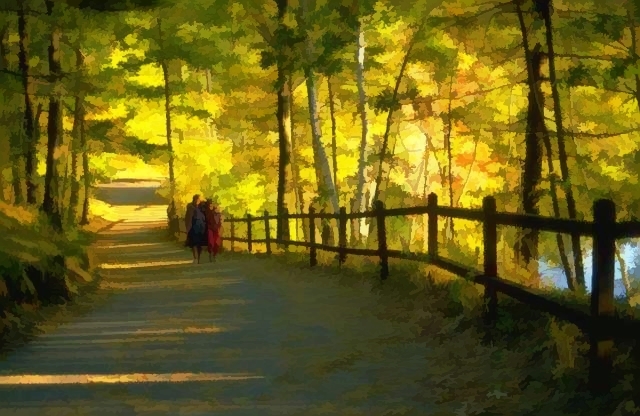 Sufficient to say that if you want to see most of it, allow the best part of a day. We were there for three hours and scratched the surface. The grounds are a delight from the spring through to autumn, but whatever the time of year, Chatsworth will always delight. Friday is often a nadir of a day, coming down from the pressures of Wednesday and Thursday, but this was a motley mixture of health and hanging around. I started by taking Rita home and then drove over to the surgery at Whittington. I had a kidney removed in 2011 with a cancer on it, so every January I have a series of tests. My blood test was a few days ago. Today was blood pressure and kidney function, plus the doctor gave me an appointment for my detailed chest x-Ray, which will be in the next few days. From there I took last night's recordings for despatch - five sacks - and then went to see a new listener and show him how to operate the media player. Back home it was a case of sorting through the e-mails I'd had to ignore for two days, and then a walk over to the Samuel Johnson Hospital to get my hearing aids upgraded. (Yes, I'm falling to pieces). Strangely the gentleman I saw this morning was called Samuel Johnson - a tough name to live by in Lichfield. We then went round to Rita's. 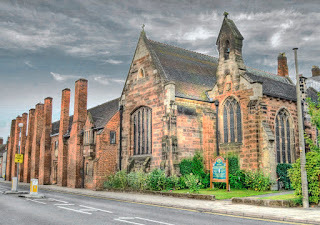 Pauline took her to the Lichfield surgery for her annual medication review (though I'd been myself, I take no medication whatsoever, and Pauline only has an inhaler) and whilst they were out I tried to reinstate Rita's e-mail and Facebook accounts. It wasn't just me, it took BT an hour to sort it all out, but sort it we did. 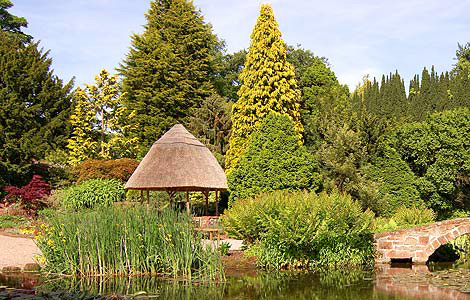 These gardens overlook the River Dee estuary, close to Chester. 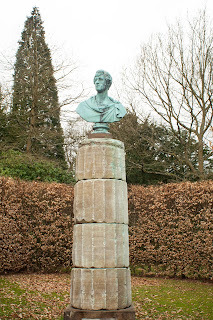 We'll be back, maybe in April, to see the rhododendrons, and my plan this year is to visit more of the houses and gardens on our list. We have to do these things whilst we are still able. 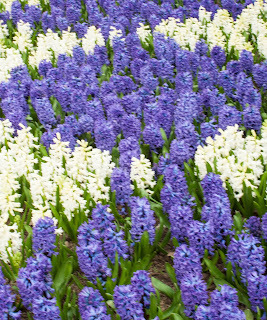 Ness is one of those gorgeous gardens where it doesn't matter what time of the year you go, there is always a great show of colour, shape and form. Ness started its journey around 110 years ago when Arthur Kilpin Bulley sent collectors off around the world in search of the exotic and colourful. Rhododendrons, azaleas, magnolias and all manner of plants and bushes were imported, but one of the most popular displays is of snowdrops, from late February. At an hotel in North Wales I was given a breakfast of sausage, bacon, egg, mushroom and black pudding. I innocently asked what was the difference between a full English breakfast and a full Welsh breakfast, to which the waiter replied " In our case, 42 miles." Pauline took Rita home this morning whilst I got on with recording the Stevenage Talking News. That went well, they got the full works but I still finished an hour ahead of normal. A quick lunch and then it was the Live at Home Scheme, this week at the Turnpike for a bar meal and a gin and tonic. I got to the studio at 5.30pm and got everything running on the new computer. It was a dream and I had all but finished by the time Wilf arrived. That was a saving of 40 minutes. I was looking forward to a nice early night when Wilf declared we had 107 tracks recorded, against the normal 52. The only explanation that I could see was that Wilf accidentally rested his elbow on the space bar (which creates a new track) but we had to reclaim the situation and it was close to 10pm when I got home. This is one of Cheshire's finest jewels. 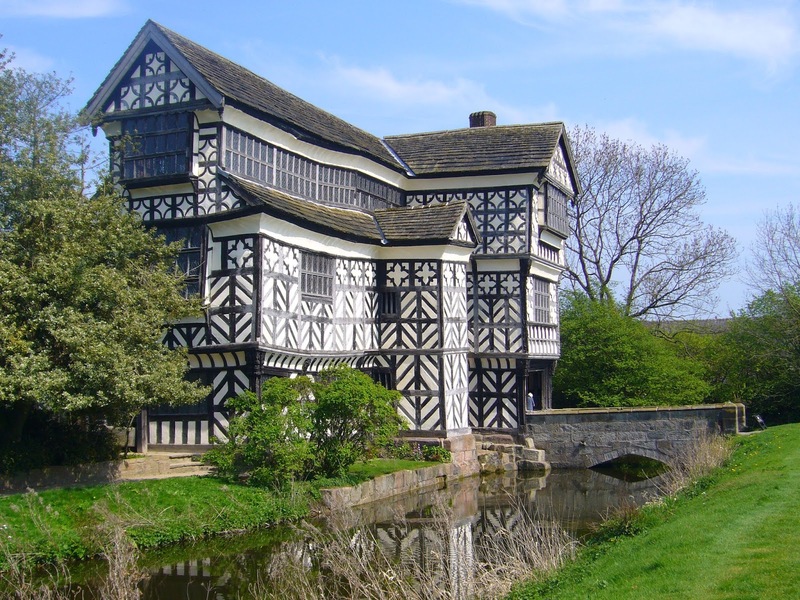 Little Morton Hall almost looks bizarre with its three storeys and enigmatic moat, but it is another of the must see black & white building that the National Trust maintains for everyone's pleasure. Work on the first part of the hall began in 1504, with various extensions and expansions being created over the next 100 years. The moat was impressive but purely decorative. Most of the rooms are open to the public and work is ongoing to gradually make more of the building available to viewing. There is certainly enough to warrant more than one visit. Where am I going wrong? I sang the song "I know a song that'll get on your nerves" - and they liked it! I got Rita back home well before the workmen arrived. Then I went to the studio to ensure that Newsbridge was working. Peter had waved his magic again. From there I walked down to the Wade Street Methodist Church where Support Staffordshire were hosting one of their information mornings. I found this useful and interesting. Wayne Mortiboys of the Staffordshire County Council told us the real details of the Syrian Vulnerable Person Scheme. If the criteria are met, it would take a heartless person to deny any of these people a refuge in this country. Lichfield will receive some next year. We know that asylum seekers are having a tough time in some areas. Apparently even some mosques are not welcoming the 'wrong kind' of Muslims. The County Council has initiated a Prevent programme designed to stop extremism and radicalisation. It was quite eye opening. Healthwatch gave some sad statistics about the population of our county. They claim that 68% carry excess weight, 20% have an alcohol problem, 20% of children entering primary school are obese and that figure rises to 33% when they leave primary school. On the way back I collected five full sacks of returns. Pauline has come down with quite a cold, but she still joined me in the garage as we processed them all. I was then set for a night off and a live webinar, which would have been the only one out of eight that I was able to attend. Then Peter O'Brien sent a message to say he too has come down with the bug and couldn't make tonight's recording. So, I was there with Jane, Amy, Jean and Terry and we put together the Scottish and Welsh recordings. 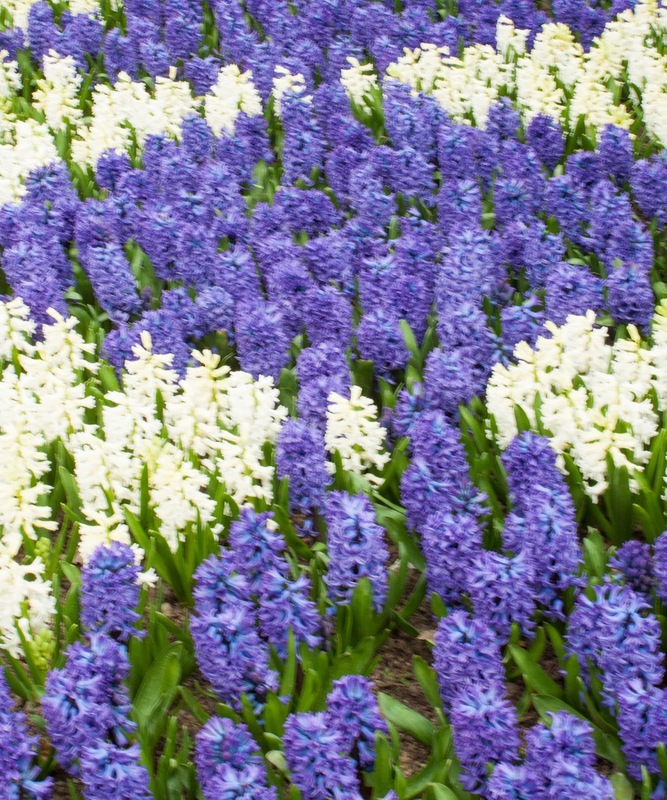 This is a must visit place in the springtime. 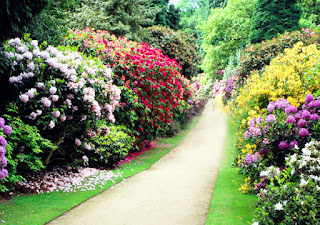 Hare Hill boasts over 70 varieties of rhododendron. 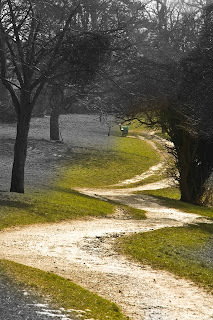 We'll try to get back there in the next couple of months, now that I am learning how to make my photos more appealing. Hare Hill is a National Trust property. The house was built in 1800 in the Georgian style. The garden was the most important feature to the last owners. They let the house go first. 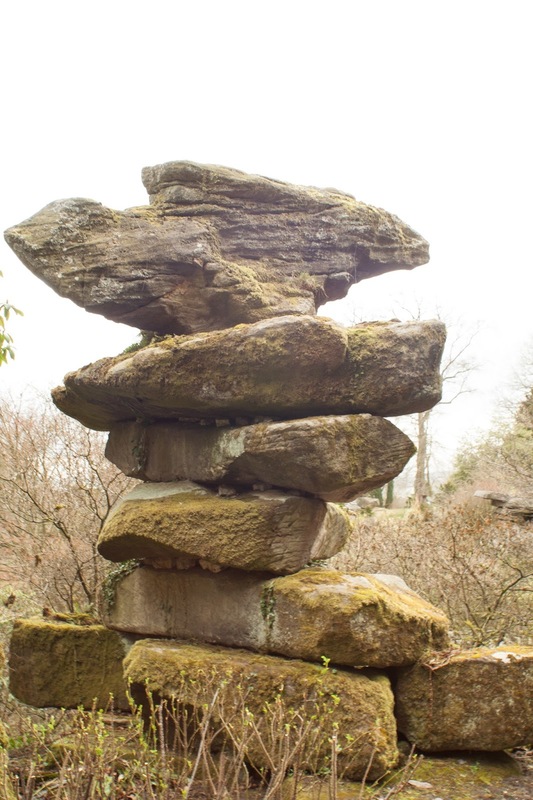 Since taking over, the National Trust has made efforts to vary the displays of the rhododendrons and has also extended the visiting season for flower lovers by planting swathes of snowdrops and many other plants so that the garden is no longer a one hit wonder. Do you learn from reading, or do you learn from observation, or are you the kind that has to touch the hob to see if it's hot enough. It wasn't pleasant outside, which helped keep me focused on everything I had to do inside. I took Rita home to greet the workmen and then came back to the computer. I did the minutes from last night and they came to four full pages. I corresponded about defibrillators, the Zone Project and the Marie Curie Great Daffodil Appeal. I processed three new listeners and got their media players packaged up for despatch on Thursday. I also prepared another seven so that all I will have to do will be put the address label on them. Pauline fetched Rita round for another night with us. I cooked and then I watched lesson 7 of my Photoshop course whilst the ladies watched Holby City. It doesn't seem much when written down but for me it was a full day. There is no point being a member of something like the National Trust if you don't use that membership, so Lyme Park was a natural enough objective for a visit. 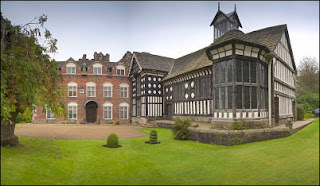 The estate began to take shape in 1346, moved into the possession of the Legh family in 1388 and remained in their care until just after the last war, when it was taken over by the National Trust. The great house is another that combines several architectural styles. Elizabethan, Palladian and Baroque in particular. Construction on this building began sometime in the mid 1500s. The formal gardens cover 6 acres but the lovely deer park is a further 1300 acres. My grandson is suddenly obsessed by women with big boobies. I shall have to demonstrate to him that they're not really big until, when you stand close to the lady, you go deaf as well as blind. All kinds of distractions just when you need them the least. It was important that we get Newsbridge working at the studio and so I went in and we made it happen, eventually, but it took a big chunk of the morning. I prepared everything for tonight's meeting and then went to have my annual blood test. There will also be X-rays, possibly next year as well. If I am still clear of cancer after six years, I think they will tell me to just get on with it. The workmen started on Rita's new shower room today. Pauline went to the knitting club and then collected Rita and brought her back for the night. There was a lot of food left over from Sunday so she transformed it all into a very hearty soup. Tonight was a Lions meeting. We were short on numbers but high on content and I thought we achieved a lot, especially regarding three projects to do with children with disabilities or special needs. 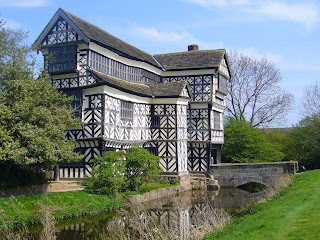 In Cheshire there is a village called Styal and it boasts a Quarry Bank. 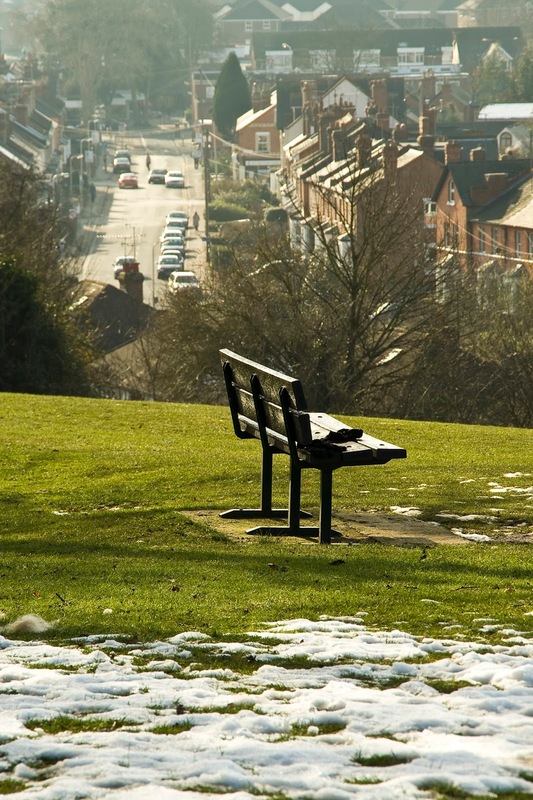 In the Black Country there is another of the same name, though it is affectionately called Quarry Bonk. 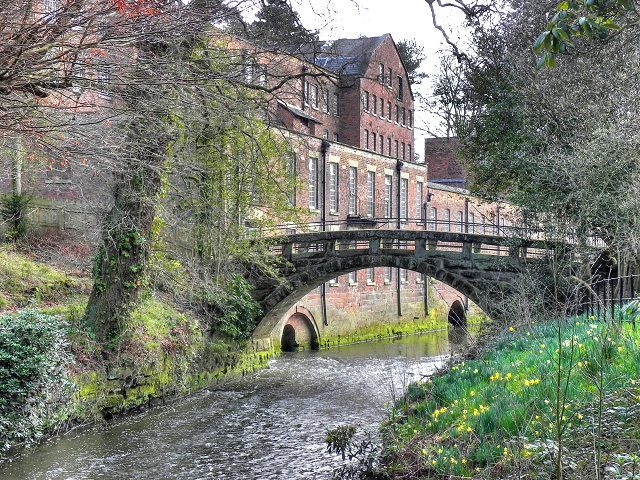 The National Trust manage the massive mill that stands on the side of the River Bollin, which provided the power for the mill wheels. Designed to spin cotton, the mill was built in 1784 and soon became the biggest such mill in Britain. The mill grew and the need for water power grew with it. In all there were four wheels installed, each getting more powerful, but eventually the wheels gave way to water turbines that could provide more power with no increase in water diversion. 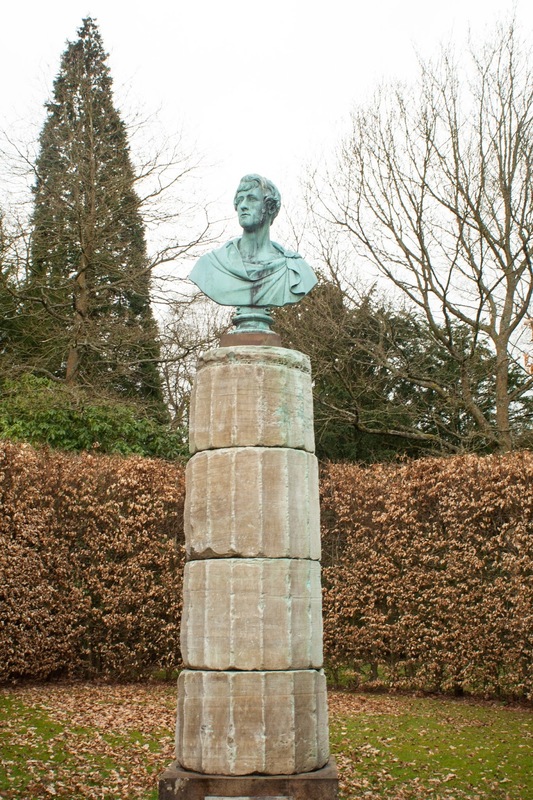 There were efforts at Quarry Bank to provide the same kind of environment as that achieved at New Lanark. There was a degree of achievement, but not quite to the same degree. That said, the mill is worth a visit. You're never alone if you're schizophrenic. I woke full of good intent and helped Pauline get ready for lunch. I was happy to take her and Rita to church, but she insisted I spend that hour getting on top of urgent items so that my mind would be focussed on our guests. She knows me too well. I was almost sorted when Pauline got back with Rita in tow. We had a cup of tea, Pauline got the lamb in the oven, and I opened a bottle of bubbles. Gerard & Margaret were first to arrive, with John and Lesley right on their heels. We toasted Rita's 91st birthday and then got stuck in to a lovely Sunday roast. We are blessed with good cooks in our family. If only I could match them - apart from my odd success. Mostly the day was chit chat, something we don't get that much chance to do. As we drove into the park I immediately realised this was a good place to visit. One thousand acres, and we had to stop the bus to let deer cross the roads. Once set up I was busy almost non stop, but I did take ten minutes to look at the other displays and take note of the beautiful flower gardens. I was barely aware that there was so much more to see. 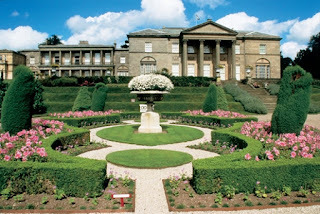 The National Trust runs the estate, which features a fine mansion and a working farm with hands on animals for the youngsters to get a taste of the countryside. 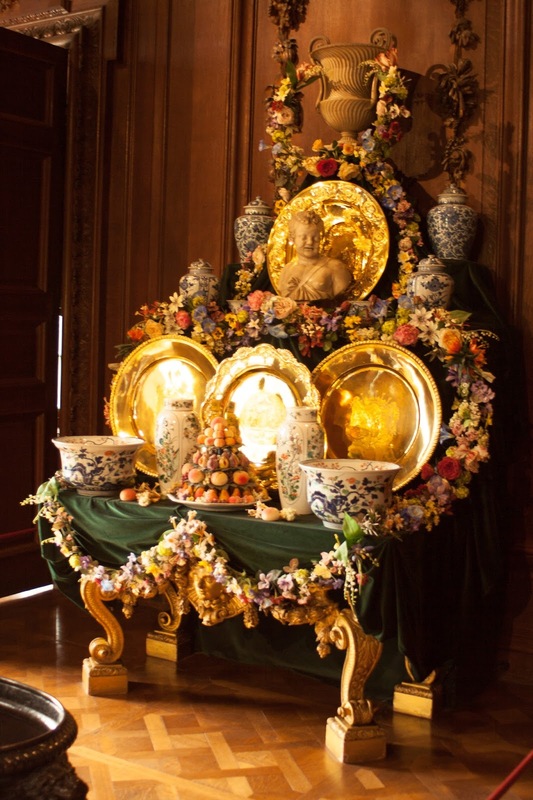 The main hall was built around 1716 and contains much of the family furniture and artwork. There is also an older hall within the grounds as well as the farm. 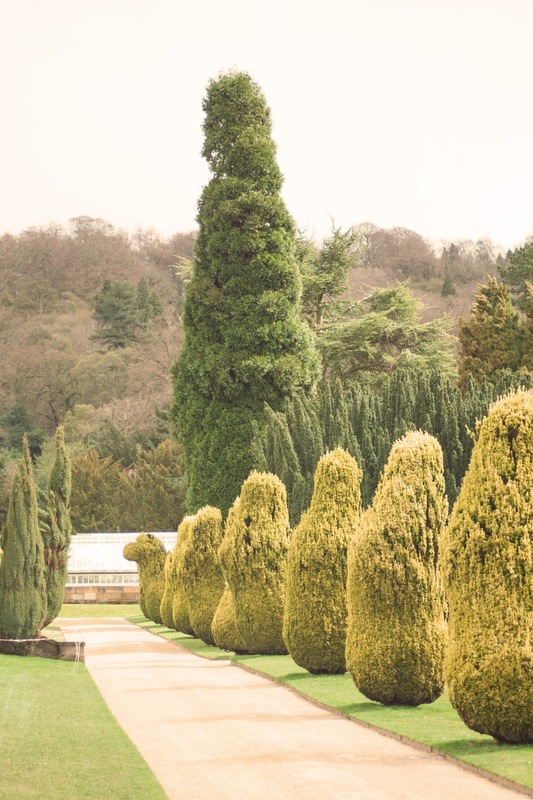 The gardens are a mixture of formal and natural. The Japanese Garden is a local favourite, although it took some work to make it so. The garden is 105 years old but had been allowed to grow wild towards the end of the last century. 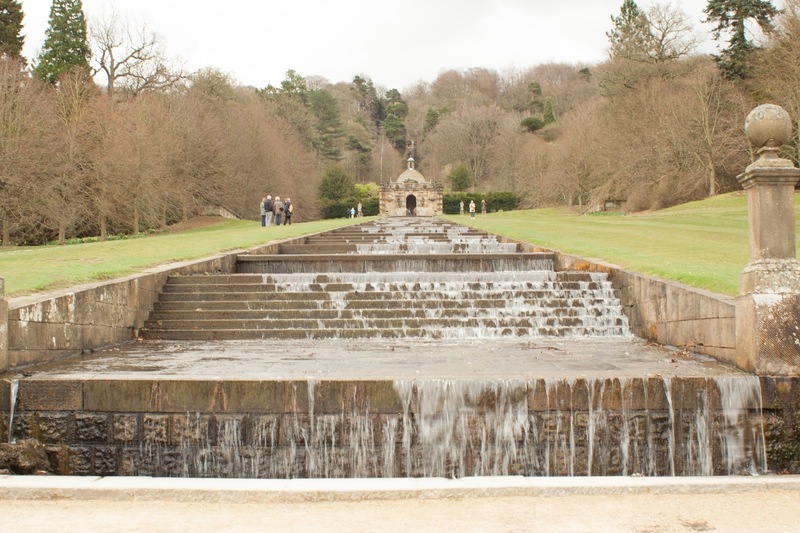 However, come the millennium it was decided to restore it to its former glory, and that's how it stands today. I've been told to stop living in my own little world. I think that was said, I was concentrating on something else at the time. I was back to front today. I started tired but finished better. I started by circulating the minutes for the SNA and then I spent some time composing the agenda for Monday's Lions meeting. If the agenda is fulsome and explanatory - and if it is read! - then it can shorten the actual meeting considerably. We have been asked to replace a vandalised defibrillator in Lichfield, to support the Waterworld Project with our three special needs schools, to arrange Riding for the Disabled for Rocklands and to assist Marie Curie on the Great Daffodil Appeal days. I went into the studio to meet Peter as he was installing the new computer. He says we will fly with this new machine. He also tried to unlock Rita's laptop, but that was quite a challenge and he had to come back to it later. Pauline wanted me to have the day off but there were six dozen e-mails for action in my in-tray. I answered those that were easiest first, left five for tomorrow, and made files of the eight that will need some effort to clear or satisfy. 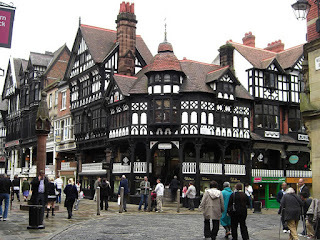 The first time we went to Chester was to a Lion's Convention, so the atmosphere was electric, because back in those days Lions was still a growing organisation in the UK. Naturally we spent most of the time at the business meetings, but there was the odd opportunity to slip out, and that's when we found The Rows. The Chester Rows are medieval shops. Black and white Elizabethan type facades overhang the enigmatic shop fronts. There is a two-tier feel to the place in parts, almost like New Orleans. Pick a sunny Saturday, wander around either within or upon the walls and you feel the buzz. 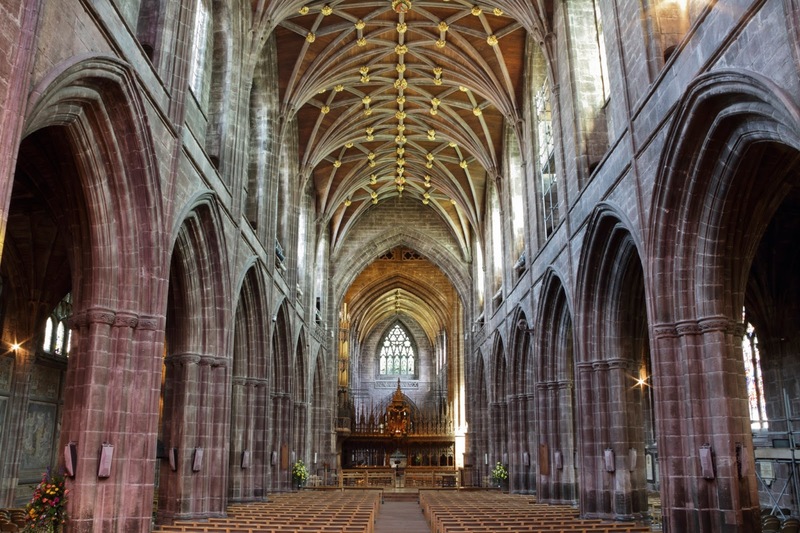 Chester Cathedral stands on a site that has housed a place worship since the time of the Romans in England. The current building started its existence around 1083. Part of it belonged to a Benedictine Monastery. It was built up to become a cathedral and was altered and reshaped several times over the next 500 years. Because of this you can find parts representing almost every form of architectural styling over the past 1000 years. The bell tower, for example, is only 100 years old. 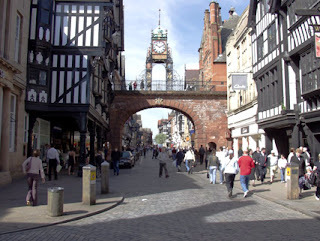 Chester is home to the oldest racecourse in Britain and the town is jam packed full on race days. 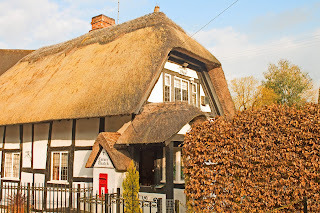 A friend and fellow Lion has a pub by the race track and tells many exotic tales, with a full Scouser accent which is undiluted, even though he has been in Chester ever since we've known him. 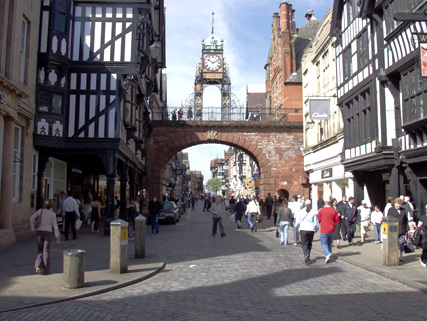 Chester has a popular zoo and a river vibrant enough to support a bustling river boat trip industry. I keep seeing invisible signs. I've pointed them out to people but they never stop to read them. Must be for my eyes only, so it's just me winning the lottery this week - if the signs don't lie. For more than forty years I would cheerfully work a seven day week, if I had to. When we started AID Ltd it was usual to put in at least 70 hours a week. We seemed indestructible back then. I now find that after a day like my Thursday I simply have to have a day off. I did no more today than I had to. I tidied the minutes from the SNA meeting and sent them to John Morgan and Steve Searle for correction. Then I took the recordings to the Sorting Office for despatch, picking up a parcel for Rita on the way. I left Pauline food shopping in Aldi whilst I went down to the banks. Money to one for us and £700 for the Talking News. One of our volunteers gave me £500 and the two Women's Institutes gave me £200 between them. Whilst in town I bought a leg of lamb for Sunday and some intriguing beef vol au vents for tonight. I spent an hour on my photography course and learned more than I expected. Then I got to the cooking. I did Mediterranean roast vegetables and roasted the beef. We had a cauliflower that needed using up so I Googled recipes and found one for roast cauliflower in a Balsamic glaze. The two parts of the meal that I had cooked on a wing and a prayer were great. The cauliflower needs rethinking. Cheshire is next on my list of counties and here there are a lot of places I've been, partly because the county is part of MD105BS and as such I visited every town with a Lions Club, but also because it was a favourite place with the manufacturers to host their car launches. 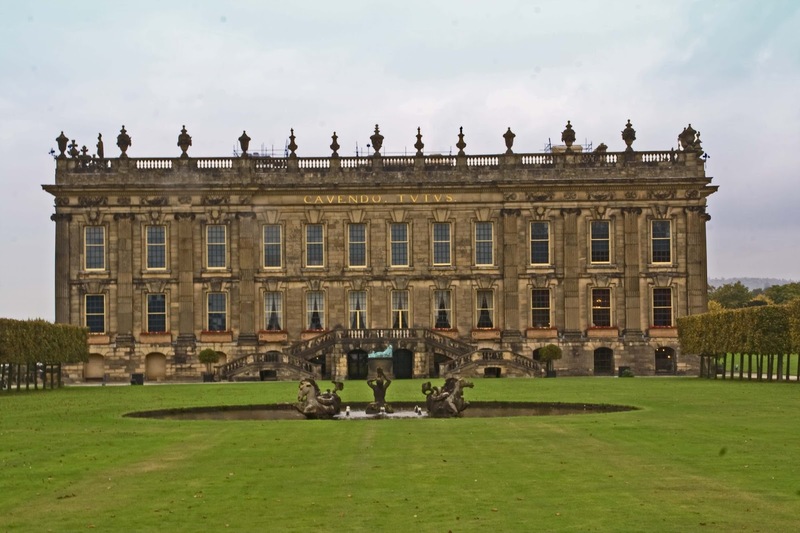 It is also well stocked with National Trust properties. Dunham Massey was taken over by the National Trust in 1976, prior to which point it was definitely in Cheshire. Now it is classed as part of Trafford in Greater Manchester. Yet is didn't move an inch. 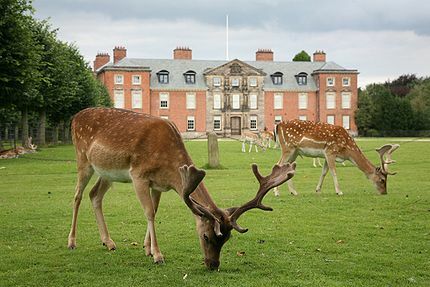 The grounds are worth a visit in their own right, but the coincidence of my first visit to Dunham Massey was that just a month earlier I'd been on a car launch in Edinburgh and one stop off point had been a stately home that had been taken over as an army hospital in the Great War. 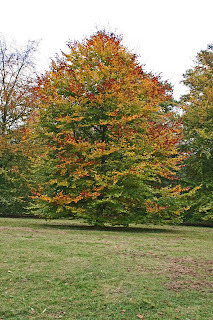 So it was with Dunham Massey. 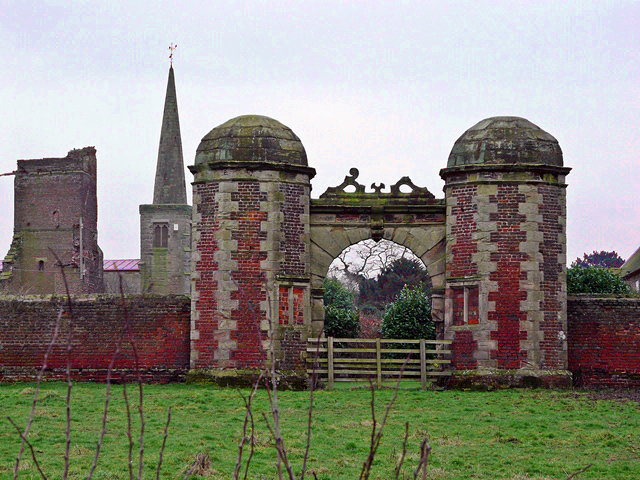 The hall as it stands today was mostly built in 1660. 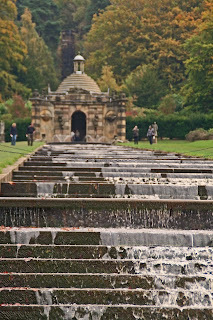 Naturally it was redesigned several times by later owners, and the moat serves as a barrier, not to invading hordes but to stray deer from the popular deer park. There are still displays of artwork - paintings, marbles and wood carvings, but what has made the venue more popular has been the recreation of the World War I hospital where 300 wounded and sick soldiers were treated. This is a living display. I wasn't planning on living forever but the way my workload keeps growing, I may have to. Still, it makes forever go that much faster. Happy birthday MIL Rita. 91 today. Sorry, no stately home, as there was last year. I didn't get to see her and say my congratulations because this was a usual Thursday, albeit colder than most. There was no time to mess, especially with minor problems still to sort out because of Windows 10. I downloaded 14 hours of magazines and then recorded the Stevenage Talking News. Pauline took Rita to Longdon for a nice lunch in the Red Lion, and I had a gluten free sandwich. I did the Live at Home Scheme run, picking up Elma and a lady not normally on my list. I collected the Lichfield Mercury and cut it to shreds, ready for tonight, and then went back to Curborough to help the LAH break the furniture down (normally performed by LAH staff - but they were short handed). I went to the studio a little early because of the problems I've experienced over the past couple of weeks. Naturally there were no problems and I had finished Stevenage and Scotland and was half way through Wales when Wilf arrived. Ben turned up, which was a huge relief as I needed to do the minutes from Tuesday's meeting. There was no Keith this week, and Peter got caught up and failed to make it, but I just finished the minutes as the recording session ended, so Wilf and I tackled the duplication and despatch, finishing nice and early at 9.15pm. I've searched my diaries and can't find any more visits to Lancashire apart from the few I've shown in the last week and the Heysham Coast. 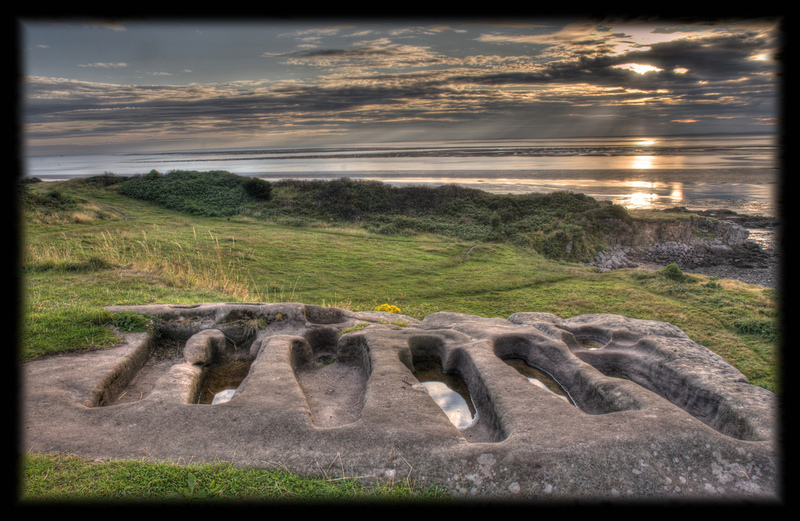 Coming from the centre of England, any coastline is always an attraction to me, but Heysham is maintained by the National Trust, so was a must visit. Pick the right day and the views are lovely. A lively sea adds character. 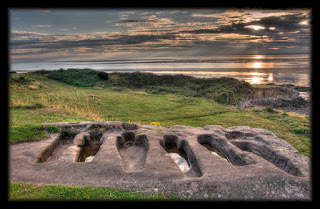 At Heysham there is the ruins of an 8th century chapel (St Patrick's) and some remarkable stone carved graves where the occupants were lain above the sandstone cliffs. Not the worst place in the world to spend as much of eternity as the elements or the developers will allow. I've just seen a proper postman. Obligatory shorts, but open toed sandals, short sleeve shirt - and no vest! My life is getting ridiculous. There is so much to do that something inevitably doesn't get done. People don't look at what you achieve, only at targets missed. Part of the problem is unnecessary delays, such as not being able to run half my computer programmes now that I have downloaded Windows 10. Newsbridge is vital to me for the Talking News, and I couldn't even open the programme. Livedrive is important because I keep all my active files in the cloud so that I can access them from anywhere. Neither is connected. Today we sorted the Newsbridge problem and have got halfway round Livedrive. I started by downloading all the news for Scotland and Wales. That took an hour (as long as it takes to read it). Then I had to address Pauline's problem. She took her car for a drive last week and has paid for it. Her foot has hurt ever since. She was going stir crazy, plus she needed to buy a present for Rita, so I took her over to Ventura, where the mission was successful. On the way back I collected five sacks of returns. I also spent an hour processing four new listeners whilst the garage warmed up a little, then Pauline and I spent three full hours emptying the sacks, checking the wallets for messages and making up three of the four mailings for tomorrow. That was the afternoon gone. I took the news into the studio and hoped that Peter would have somebody to read with. Fortunately Amy turned up and so I was able to come home for a Lion's Board Meeting. That took until 9.30 and I hadn't even started on the minutes from yesterday's meeting. 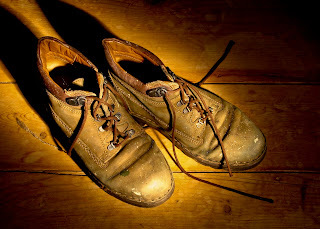 You could ask where do I find the time to write this blog. Usually in bed, on my I-pad, or sometimes in the bath. I really like Speke Hall. There are half a dozen houses dotted around the country of the Elizabethan era and they all grab me the same way. There's one near Wolverhampton and I'll go there again in the spring. 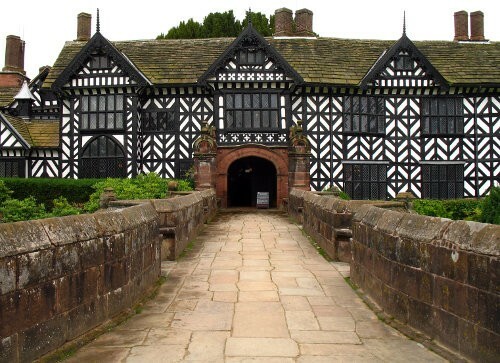 As with many great houses in Britain, Speke Hall was built on the site of former, less stable buildings. The first main part was finished in 1530, but to get to its full size took forty years. The National Trust have tried to make the property visitor friendly, so some of the property has been made over to café and restaurant and visitor centre, but other rooms have been restored to their former use, especially the gun room. There is something about the oak beams and wattle and daub of an Elizabethan house that gives it more history than brick build stately homes. There's a sense of hustle and bustle rather than Downton Abbey. All of the rooms are furnished (there's even an ancient snooker table - or maybe not so ancient) and the grounds are big enough to host 10k races. Pauline and I have a strict division of labour. She tackles the housework, shopping and domestic economy. I handle the Aston Villa situation. There was no time for meandering today. Details of three new listeners came in and I didn't even have time to process those. My first task was to attend a funeral. I didn't know Owen Mitchell but Pauline Mitchell has been coming to the Talking News and reading for 34 of the 35 years we've been doing it. So I owed her some support. Her partner at the microphone for the first 20 years was Kathy Peat. Kathy is now a listener herself, so cannot drive, so I collected her and we went over to Fradley for the ceremony. It was a Humanist ceremony. I thought it was poignant and tasteful but Kathy clings to her religion and felt it lacked hope for the future life after death. I told her I've got the best of both worlds because I don't believe in sectarian religion, but I do think the body is the vehicle that carries your soul from life to death. Part of me wants to see what comes next. A bigger part of me wants to see my grandchildren grow and flourish. Jan Allso was there. Owen was played out to the tune of "It's a Wonderful World" by Louis Armstrong. Jan asked what tune they'll play when I go. I said it would be Wish me Luck as you Wave me Goodbye. After lunch I went over to Rugeley for our monthly meeting of the Staffordshire Neurological Alliance. I forgot that we had decided to have a Board Meeting before the main meeting, so I was late. We are at a new venue for our meetings, and they spoiled us. Tea, coffee and a plate of chocolate biscuits, and half way through they brought in a plate of cream cakes. And I'm gluten intolerant. I was much aware that I had left Pauline on her own all day, and then I was out again tonight. I drove over to Hill Ridware for a meeting of the Women's Institute. I'm getting used to singing Jerusalem. There were 38 ladies in the audience on a bitterly cold night, but we had a few laughs and they were fascinated by the Talking News. They gave me £50 for the TN, double the normal speaker's fee, three ladies thought they know someone who will benefit, and another lady gave me £5 as I left. You say I lack urgency, but tell me, how many people you know can read The Times (news, football and do the crossword! ), do their Brain-training exercises, have breakfast and a shower - ALL BY 10AM! I hit the ground running. I had to. If only I could have kept it up. I wrote letters to each of the three special needs schools in Lichfield giving details of the Waterworld event that will take place in Stoke on Trent in March. Last year 660 special kids attended, many from our three schools. I also wrote to Barclays Bank to ask if they would match our funding of a replacement case for the defibrillator that was vandalised a couple of weeks go. Malcolm came to do a series of jobs around the house for which I am totally ill equipped. I helped him remove the cooker and then left him to placing two new plugs so that we can more easily use the microwave (essential for Pauline's porridge). He also put new lights up on the landing, mended broken units in the bathroom and reconnected the extractor fan. Meanwhile I processed a new listener and tried again to fix the problems caused by installing Windows 10. I keep my more important files in the Cloud, and Windows has disconnected the directory. I can still get in, but it's a nuisance. Newsbridge doesn't work, and that's even more important. I also couldn't load my new internet security programme, but I also sorted that. I booked appointments for my annual blood test and x-Ray to make sure my cancer has still gone, plus a hearing test - which Pauline appreciates because I can't hear her half the time. Tonight Pauline went out with the girls and I drove over to Cannock for a meeting with Cancer & End of Life. 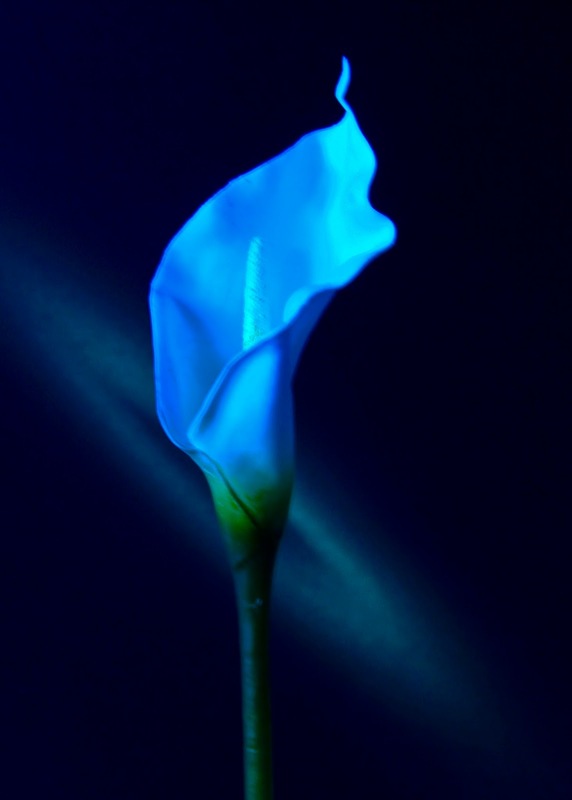 This group has been established to try to improve the lot of people affected by either cancer or have an illness that signifies end of life as imminent. I found the meeting moving, poignant and informative. There is something about a traditional Elizabethan house with black timbers and white plaster. Rufford Old Hall fits the bill. Built in 1530, much of it didn't last too long and a brick built Jacobean extension was added some 130 years later, and then a second wing was added in an altogether different style years later. A hodge podge that nevertheless has appeal. The house looks almost semi-detached, given its contrasting styles, and it is the Elizabethan part that grabs the attention as you approach. The Great Hall is sparsely furnished, with the several suits of armour and weaponry on the walls, but the ceiling and rear wall are powerful, large wooden carvings and structured, darkened by the ages. There is an oak screen that dates back to the birth of the house. This highly ornate screen would have been perfect for an aspiring young actor to hide behind, popping out one side as a Romeo and coyly shifting out the other side as a bashful Juliet. 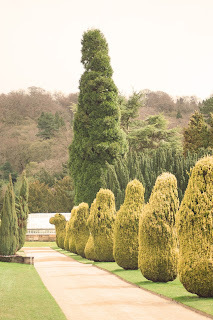 The gardens are neat but unadventurous, except for the range of topiary, especially the two flying squirrels. The lawns are extensive with plenty of space to walk, sit in the sun or hide in the shade of the many but well spaced trees. 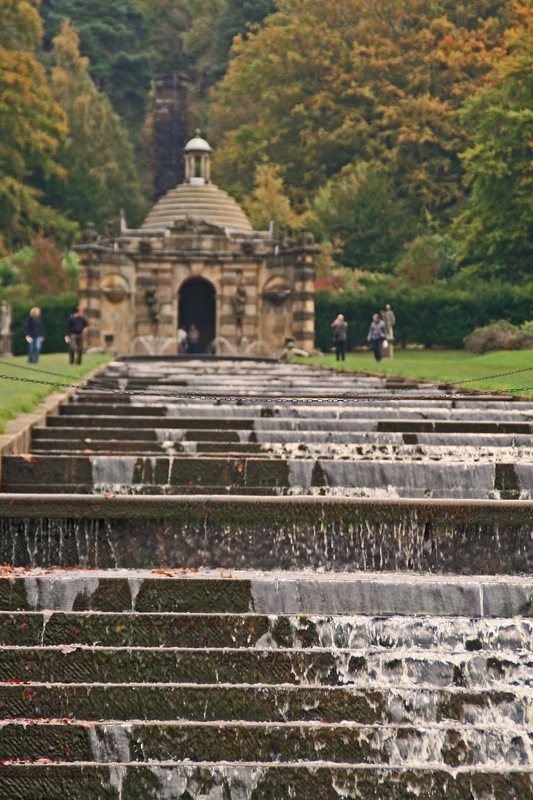 Walk along the waterside and then look back at the contrasting styles. Malcolm is our handyman. He's not much good but he only lives next door but one. It had snowed all night but left less than an inch. It didn't rise above 3 degrees all day, but with no wind it didn't seem cold. I sorted out my priorities and then set about distributing the agenda and reports for Tuesday's meeting of the Staffordshire Neurological Alliance. Everything I've touched lately has turned against me. The new internet security programme I've got won't load and now Windows 10 has disconnected Livedrive and I couldn't pull things together properly. Eventually I did, but it took half the morning. I fetched Rita round for the day, Pauline cooked a lovely casserole, I spent an hour on my Photoshop course and then did the last bit with the stamp collecting until the next album arrives. Now I'm back to Lancashire with my memories and have surprised myself by how few there are. For some reason we didn't do many car launches in the county and it's just a tad too far for the casual day out. 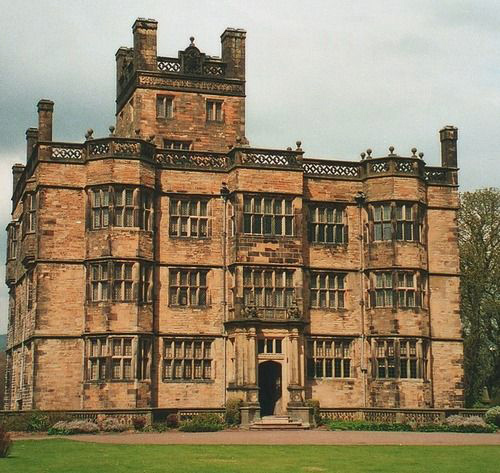 Nevertheless we have visited a few National Trust properties, Gawthorpe Hall among them. Actually, if anyone is planning a visit, it will close from May for the rest of the year whilst essential restoration work takes place. Gawthorpe Hall (not to be confused with Gawthgorpe House in Yorkshire) is Elizabethan but was built on the site of a 14th century defence tower, which was incorporated into the original house. 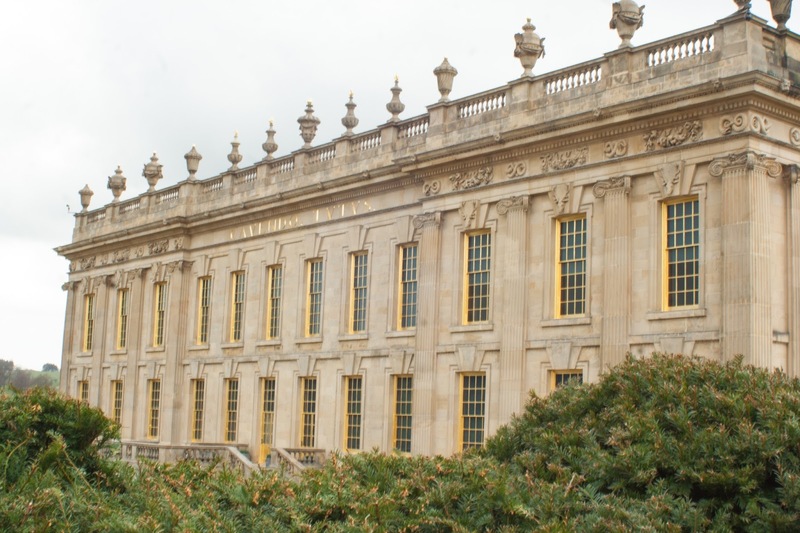 Work on the extensions began in 1600 and the building was lived in seven years later. There is a good collection of portraits on display, few of them originating at Gawthorpe. Most of them are on loan from the National Portrait Gallery. The interior design and make up has been altered many times. 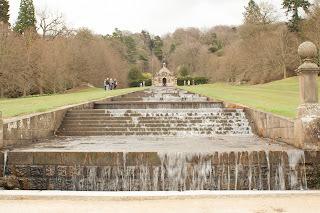 The main garden is not large but the extended grounds offer some pretty and interesting walks. She sells sea shells on the sea shore. Personally I scratch around and get them for free. The road to Hell is paved with good intentions. I think I've added a side road. I pick up the ten most urgent projects, sit down and start to tackle them and four hours later the pile is now fifteen. 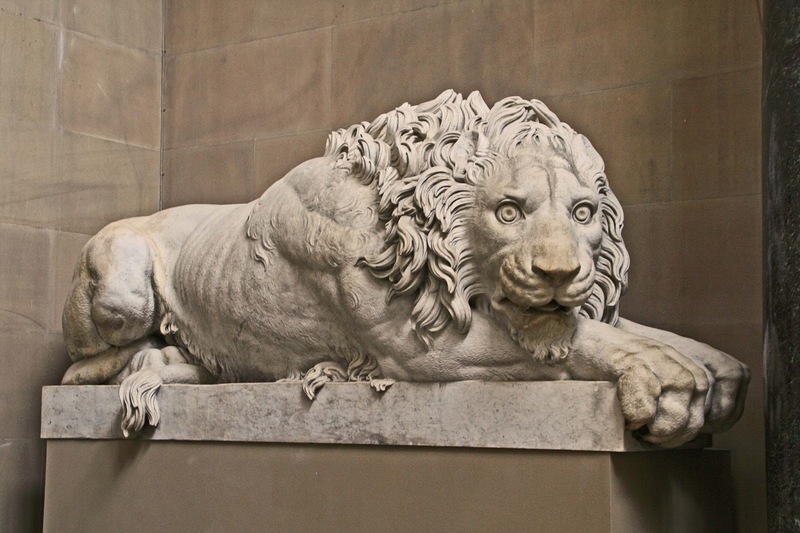 The rule is Family first, work second, Lions third (along with the SNA and the Talking News). So today we thought we would pre-empt the oncoming snowfall and did a food shop for ourselves and Rita, just in case. Then I visited two new listeners. The first was easy. A very receptive welcome, ready acceptance of the media player, memory stick and all the instructions. He even offered to pay, but I told him to wait until he was sure he was satisfied. I went to listener Number Two. He was very keen. His wife said it was a waste of time. He said he would like to give it a try. She said he doesn't need it because she reads the Mercury to him. He said she only reads what she thinks is interesting, not what he thinks. She said it was still a waste of time, he was too daft to take anything in. He said "I took you in, didn't I?" I left it with him to play with. She said I can go back next week and collect it. Tonight was a quiz night organised by the Lichfield Soroptimists on behalf of the Talking News. It was very well attended and included a fish and chip supper. These quizzes always serve to make me realise how little I know. We came about 7th of the fourteen or so teams, but there was a lovely atmosphere, Peter Fox was on his usual irreverent form - and the snow did arrive and we had a white ride home. One good thing about snow. Our garden is now as good as everybody else's. Friday, so, my day off. I needed it. I don’t bounce like I used to. I spent the first part of the morning working out my workload for the coming week. 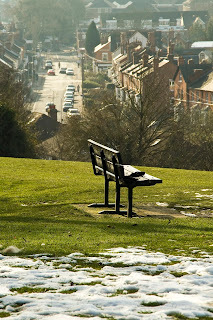 Monday there’s a meeting of the Transforming Cancer End of Life Group, Tuesday there is the monthly meeting of the Staffordshire Neurological Alliance and also I am addressing the Hill Ridware Women’s Institute about the Talking Newspaper, Wednesday there’s a Lion’s Board Meeting to discuss the membership drive and social events. I’m also expecting to have to read on Wednesday night at the Talking Newspaper as well as process all the returns. Thursday will be the usual manic 14 hour day, and then I’m back to Friday and making bread. In between I want to catch up on my new Photoshop course. Those that have followed this blog for a long time will be aware that I try to support my meanderings with pictures. Since I decided to revisit all of the places I have been to in my life (more virtual than actual this time around) I have realised how poor some of my photos are, so when a chance came to sign up for a Photoshop Course with the Shaw Academy I did so. 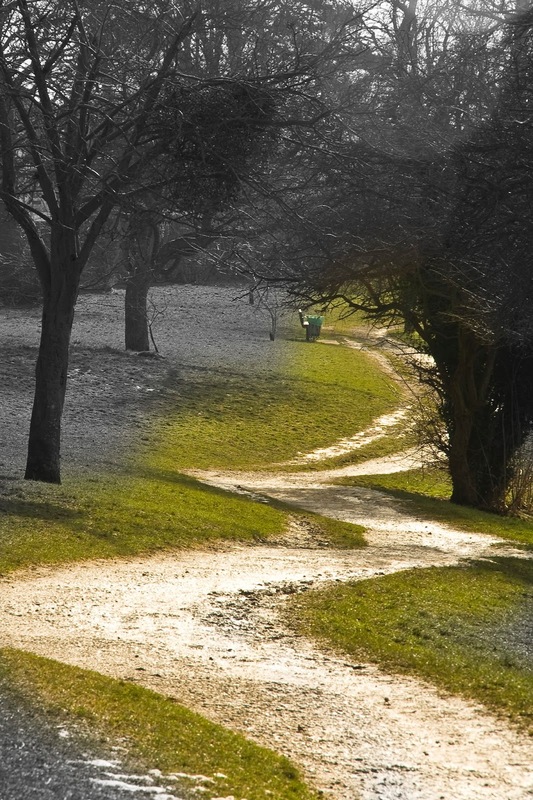 As the first lesson came along I was contacted by a support contact, and that impressed me. Then my diary hit me and I realised I would not be able to join in with more than two or three of the live lessons because of Lions, the SNA and Talking News clashes, but the lessons are on video 24 hours later. I went through Lesson One and the presenter was a young lady called Deirdre McGing. I immediately realised that I’m not as quick on the uptake as many of her students and was grateful to be watching on video because I could pause it to make my notes. I got to Lesson Two and hit a stumbling block. I simply couldn’t see the same as I was being shown. So I sent Deirdre an e-mail. She replied in person, by phone. She was so supportive and understanding of my shortcomings and explained which programme I should have been in. I discovered I didn’t even have that programme on my computer, so I downloaded it and then I was on the same path. An hour later and everything was making sense. Whether I learn what I am supposed to will soon be known. I wish I’d found this course before I started this recap exercise, but that’s the story of my life – do something for ages and suddenly find a better way. Whatever, what I’m trying to say is that if any reader wants to better their photography, I strongly recommend the Shaw Academy, and it doesn’t matter where you are in the world, you can still join in – even if it is at an unearthly hour of the day where you are. I met a stunning blonde last night. She's not safe with that Taser. This was a normal Thursday in most respects, just a bit colder. I got straight to downloading everything needed for all the different TNs, gathered all the birthday details and then recorded the Stevenage Talking News. I gave them quite a bit more than usual. I did the Live at Home Scheme run and then finished packaging six media players for new listeners. I had produced the labels for most of them yesterday, but Pauline had tidied my desk! I hunted high and low for the missing labels, finally set about producing them all again, then found the original in the printer - the one place I hadn't looked. That was one hour lost. I got to the studio at 5.30 and started on Gwent and Scotland whilst Stevenage was duplicated. After 45 minutes I hadn't been able to open Newsbridge, the programme that we use for all of our recordings. I was just on the point of abandoning operations at the studio and coming home to use that computer when - from absolutely nowhere - the thought came to me that it might be our anti-virus programme causing all the problems. I have no idea why that thought arrived, but I uninstalled the programme and voila - it all worked. The frost came down, the cars froze up but we were away by 9.45pm. If you want to preserve something you steep it in alcohol. That's me sorted then. My first meeting was at 10am at Stafford, just 20 miles away. I decided to allow plenty of time, and I needed it. I left home, traffic lights at roadworks to the left of me, so I went right. The first set of lights I reached refused to change for those going in our direction. The other side would change for pedestrians to cross the road, then go straight back to green. Just when I thought there was no way out, they gave in and through we went. I'd lost five of my 20 minutes grace because the car was iced up and now I'd lost 5 more. Once out of Lichfield the drive was lovely, low sun and bright blue sky. The meeting was at Healthwatch and was about neurological conditions and I learned more in those two hours than I have in any one session. Back home I collected the returns and then spent two and a half hours processing them. Then I downloaded the Welsh and Scottish news and took them to the studio for the Wednesday team. Next it was to Shenstone for a meeting of the WI. I had addressed the Shenstone Women's Institute in November 2014 and I remember the reaction I got when I told them about the Talking News. A few weeks ago I got a call to say they were collecting money for us and would I go back and talk again. I'd asked what about, as I'd exhausted my Talking News stories, and the lady had said " Well, you carried the torch and got the MBE. We'd like to know all about it. I sat outside the meeting room in the rain wondering how to tackle this without seeming self important or big headed. So I decided on humour and self deprecation. I assured the 47 ladies gathered on this gloomy night that I had never done anything with the thought that it might result in reward or recognition. I told how I stumbled into the talking news and my first awards in Lionism, which another Lion had inadvertently secured for me in trying to get something for himself. I told how my mother had been made a Free Woman of Coleshill in Warwickshire (I still have her medal) ,and her reaction. "John, they want me to wear this medal on parade days." When I asked what else was attached she said "Well, I don't have to pay rates!" 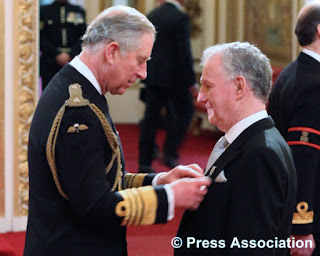 I told how younger son Daniel had been to Buckingham Palace three times and has the OSJ (Officer of the Order of St John), and how elder son Robert will shortly get the freedom of the City of London, and how I asked him if he doesn't have to pay rates, to which he replied "No, I do, but I can drive my sheep over London Bridge." I described our day at Buckingham Palace and how good Prince Charles had been. " MBE stands for My Bloody Effort!" 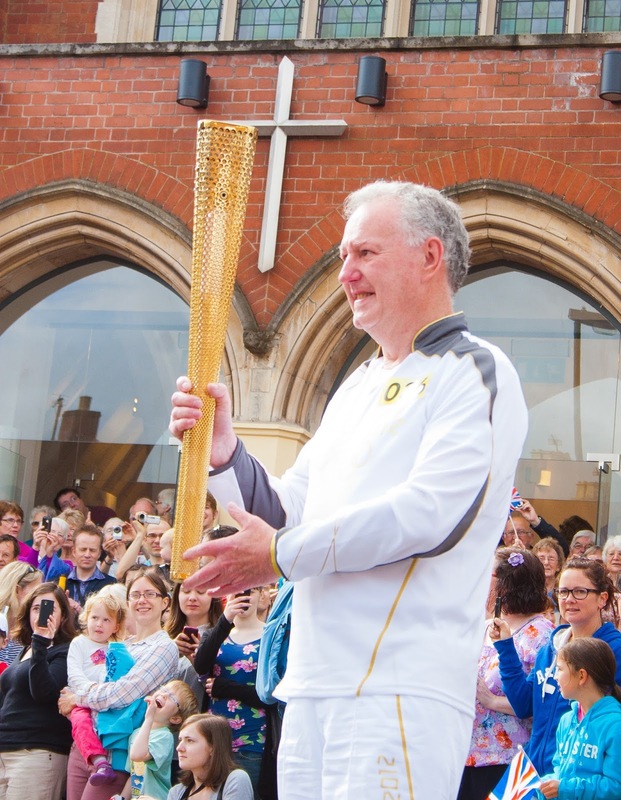 Then I talked about the day I got to carry the Olympic Torch through the streets of Lichfield. Whilst all of this was going on the torch and the medal were passed from hand to hand, so that everybody got to hold both. We had some fun, I felt a bit humble, and they gave me £150 for the Talking News. Went to a meeting in Stafford and somebody asked "Are you Dan May's dad?" Went to a meeting in Shenstone last night and somebody asked " Are you Dan May's dad?" Fame at last - for being Dan May's dad. One thing I have learned from Pauline being afflicted is how much I rely on her goodwill in order to do the things that I do. Having to cater for her and help more around the house has brought home just how much freedom she has allowed me over the 47 years we've been together. No wonder that people raise their eyebrows sometimes when my shenanigans are brought up in discussions. I am trying to say I am thankful for her support and grateful for the slack line that she keeps around me. This morning was mostly about the minutes from last night. It took longer to put those together than it did to hold the meeting, but they are so important. I also processed three new readers to the Talking News, and it's only Tuesday. This was also a red letter day in that Pauline got behind the wheel of her car and took it into Lichfield - to buy me a present. My first serious visit to Blackpool was in 1993, at the invitation of James E Woods. Jim was District Governor of MD105BN and I was his neighbour in 105BS. BN were hosting the Disability Games for the EFDS in Blackpool and we went up for the weekend. I found the whole event quite humbling and uplifting at the same time. Three small things stand out for me from that day. The camaraderie of the athletes was outstanding. All kinds of disabilities competed against each other. Some were more able than others. I watched a race where one boy could run like a 'normal' child whilst some of the others had legs that seemed joined at the knees. When the winner steamed through the tape, instead of a lap of honour he immediately turned and encouraged every other competitor to cross the line. It was heart-warming. There was one event that simply involved throwing a bean bag over a high jump rope. One girl couldn't get her fingers to release to let the bag fly. It must have taken twelve minutes. No one pressured her, everyone gave encouragement and when she finally managed the feat you would have though she had won Olympic Gold. 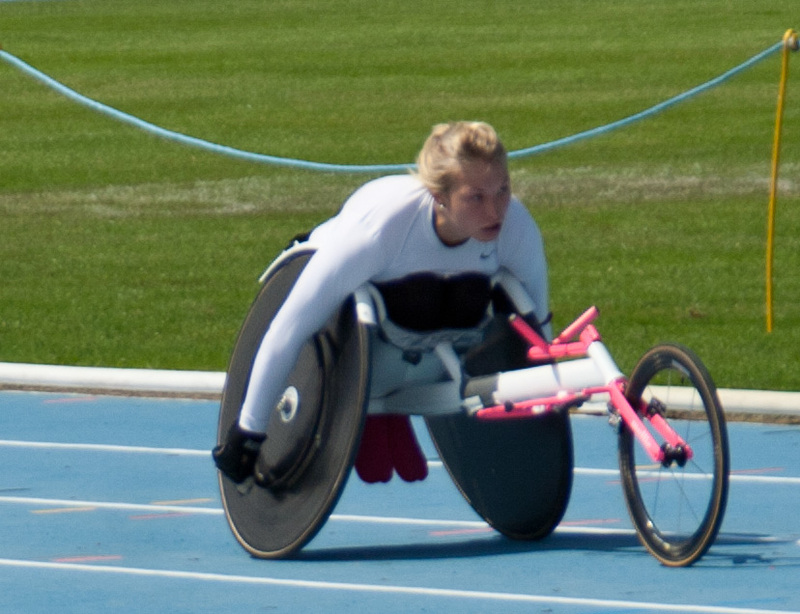 The final thing from that day was the wheelchair racing. The competitors put a lot of effort into that event and were whacked at the finish. The boy who won was surrounded by well-wishers, and by one young able-bodied boy whose only interest was in the chair. He kept trying to egg the owner out of the chair so that he could have a go. Finally the competitor snapped. "You want my wheelchair? I'll swap you. I'll give you my chair if you give me your legs!" I was so moved by the event that when, some years later, I was asked by the Lions if I would be the liaison between the EFDS and also the Special Olympics UK I immediately said yes. We did a lot together. I helped raise £80,000 to finance several events, plus I went to as many sports events as I could. One stands out. We were at Warwick for the final of the EFDS sports. A very attractive young lady sat not far away from when I was stationed and I was witness to her interactions with those around her. Samantha was a joy to watch and listen too. She was pleasant to everybody around her and encouraged every athlete as they made their way around the sports ground for their particular event. Finally it was her turn. They wheeled a sports chair up to her, lifted her from her seat and strapped her in the wheelchair. She had almost no legs. What she did have didn't function. 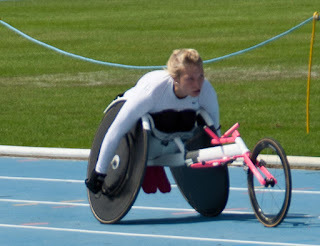 The event was 1500 meters and so four times she powered round that track, finishing a full straight ahead of everyone else, but again, going back and encouraging the others. They say fight fire with fire. I say use a water cannon. You might get wet but you don't get burned. I've got twelve more Lions meetings to make sure that the progress we've made in the last six months is maintained, so I spent quite a bit of time on preparing for tonight's meeting. I also had a go at making sense of the photos I have on file on my computer. All 6800 of them (I lost a lot!). After lunch I took Pauline and Rita to the knitting club. I then went into town, to two banks and Holland & Barratt for gluten-free cereal. It is suddenly quite cold out, so I was early in picking the ladies up so that they got into a nice warm car. I thought the meeting went well tonight. District Governor Chris Aked was there, mainly to add to my thanks to the two Johns (Cassie and Whitehouse). We got through a lot of business and had plenty of fun along the way. The meeting was over in an hour and forty minutes. Wish I could do the minutes that quickly. 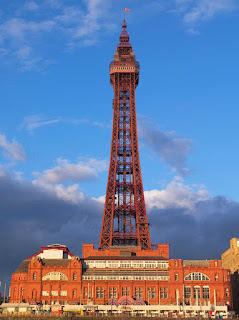 Any look at Lancashire has to include Blackpool. I first went there as a young boy. We didn't have many holidays when Barry (brother) and I were growing up. We went to Barry (in South Wales) to stay with Auntie Kath and to Portsmouth to stay with Grandma May (and to get burned!) but I only remember three that weren't to family. The first one was to Blackpool. I remember that we stayed in a B&B. The landlady was kindly enough, but we had to be out of our rooms by 10am and weren't allowed back in until 5pm. It was a trek down to the beach, but we had plenty of time at our disposal. We didn't see the illuminations that year. These have been shining brightly for at least 66 days a year (from late August until early November) since 1879. I've seen them plenty of times since and they are always different. 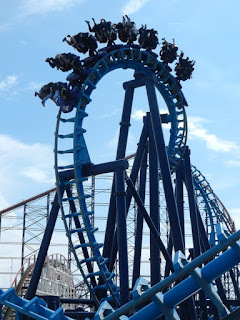 The year before the illuminations started, the famous pleasure beach was commissioned. It has been owned by the same family for 140 years. We did get to see that, though, with our limited budget, it was mostly in admiration. Blackpool became the holiday Mecca for the north of England. Stories about Blackpool landladies became stock-in-trade for comedians all over Britain. It was a magnet. As the 1950s got well under way it became the practice for towns and villages across the Midlands and beyond to send coach loads of young people up to Blackpool to 'see the lights'. It was always worth the long ride. There were no portable radios and such in those days so the communal sing song would start when the driver cranked up the engine, and finish when everyone was asleep. 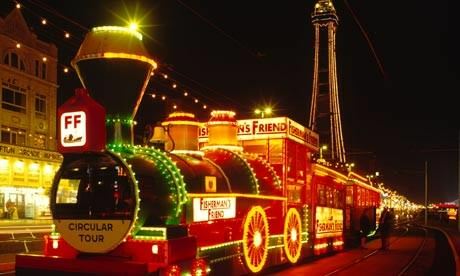 To only mention the pleasure park and the lights is doing Blackpool a disservice. We have our own miniature version of the Eifel Tower (though it's big enough for us if you've never seen the real thing) and Blackpool hosts hundreds of conferences and the Blackpool Tower has Britain's biggest dance floor at the Tower Ballroom. David Attenborough had a show on TV last night all about beavers. Best dam show I've seen. I started the morning getting myself ready for the next few days ahead. Sue Wale called for Pauline and Rita and took them to church so I filled the rear of the car with rubbish and took it all to the tip. Rita came back for the rest of the day. We had soup for lunch and slow cooked lamb for dinner. I spent three lovely hours on the stamp collection. We're getting there. I plan to cover Lancashire now with my reminiscences and Leyland plays quite a part in my life, albeit obliquely. I had a friend at the Society of Motor Manufacturers and Traders in London. We had met when Lucas sent me down to garner some statistics and we had an instant rapport. Harvey had a special needs daughter and with my experience at Rocklands School, that gave us common ground. 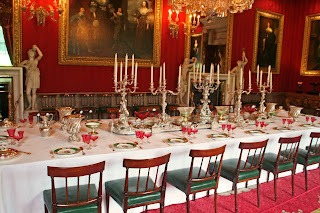 When he wanted to come up to the Midlands to watch a football match, I invited him to lunch beforehand. When I needed information about the world tractor industry, it was Harvey that put me in touch with Peter Schmidt. Peter Schmidt is something of a genius and therefore hard to live with, but we forged a partnership that eventually became Automotive Industry Data Ltd. When I first met Peter he had been sent to Preston by British Leyland because he rattled too many cages at headquarters. On my way to meet him for the first time I glimpsed a church that, because of the angle of view, looked peculiar. I later found it wasn't, but my curiosity had been tweaked. Peter and I got our business underway and it was a tough start. Nobody seemed interested in what we had to say, or disbelieved it because we were not conventional. A rumour started in the industry that Leyland Trucks was being sold to General Motors and the press and local TV contacted Harvey, who promptly put them in touch with me. Would I be interviewed on TV? It takes over two hours to drive north to Leyland, but off I went, dressed in my Sunday best. When I got there the TV crew invited me to stand outside the gates and tell the watchers what it would mean to Leyland Trucks to be bought by GM. The cameras rolled and I said that there was no way that GM would buy Leyland and that if anyone would it would be Daf Trucks of the Netherlands. The cameras stopped, I was thanked for my trouble and dismissed. So I took the time to look at the church close up and then headed forlornly back down the motorway. I got a 30 second blast on ITV and that was it, until six months later when Leyland Trucks became part of Daf! That stunned the automotive world. 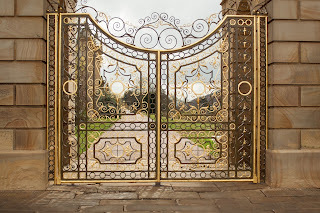 No one ever dismissed us as cranks after that and doors began to open. 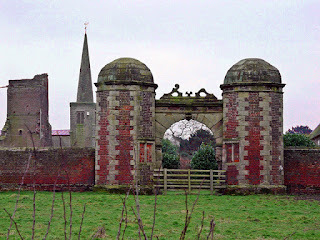 What I found about Leyland is that although the town has been around since just after the Roman invasion, and was recorded in the Domesday Book, very little has ever happened there and there is little to see. It didn't even get the obligatory castle. But Leyland was important to me, so I looked. 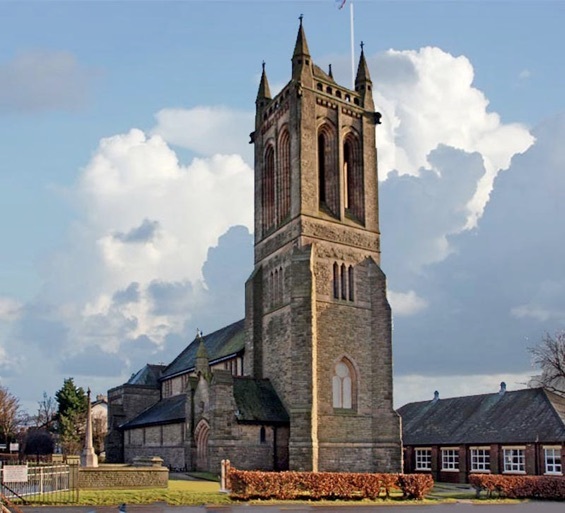 The church is St Ambrose and is quite new by British standards. The population in the area was fairly small but in the 1880s there was a surge of growth and a local priest argued that a bigger church was needed, and in 1885 the new church of St Ambrose was dedicated. 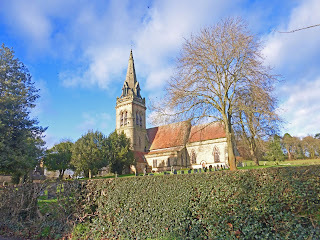 Whenever I drive north up the M6, I always look to catch a glimpse of the church and the start it gave to me and Peter. I said to her "You just don't get irony, do you." She said "I do the laundry." It was very cold first thing but quickly warmed up. I wrapped up against the wind and set off on foot to visit a new listener to the Talking News. Robert bought me a health app for Christmas and so far I haven't achieved more than 50% of my daily goal. Today I got to 68% steps and 100% on calorie burn. My new listener lives at St John's Hospital Without the Bars, in St John Street. More about that below. This was a lovely man of 86 with a charming and caring wife. We chatted for half an hour. I told them this was the first time I'd stepped through the entry gate, even though my first office in Lichfield was next door but one. On the way back I shopped for vegetables and then we elected for an afternoon off. Pauline made a wholesome soup and I completed Lesson 2 of my Photoshop course. These first lessons are all about the basics. Pauline took rib eye steak out of the fridge and told me to cook that 'lovely recipe you used last time'. That was six months ago and I had no idea what I'd done. So, in case I ever get asked again - I seared the steaks on one side for a minute and put them aside. I caramelized onions, added paprika and 300ml of red wine and brought it to the boil. I put the steaks back in, seared side up, and left everything to bubble away for twenty minutes. Meanwhile I did new potatoes and then fried mushrooms and eggs. I placed the potatoes and steaks on the plate, covered them with the sauce, put the mushrooms on top, added grated Parmesan cheese and then topped it all with a fried egg. Next to my office was a small church and then St John's Hospital. I soon learned it had never been a hospital - the word came from hospitality. When the Normans built the cathedral they put walls and ramparts around it. Later they put a wall all around the city with four city gates. These closed around 9pm every night and so travelers arriving after that time found themselves locked out. This led to the chapel being built and the 'hospital' next door to that. When I first moved to Lichfield I heard stories of travelers arriving carrying too much money, so they would stash it somewhere safe whilst they stayed in the hospital. Enterprising miscreants would keep an eye out for such activities and the traveler often returned to an empty cache. Some were still being found with the advent of metal detectors. When the walls around the city fell out of use, so did the hospital and it languished. Then the idea came to make it an almshouse for 13 honest and aged men, who would also receive 7 pence a week. That was in 1495. The eight straight chimneys were added and each occupant had his own fireplace. The building was rebuilt in 1720, and a few times since. Married couples were allowed to live at the newly expanded sheltered housing from the 1950s, hence the couple that I visited. I'm always shattered on a Friday. Wednesday & Thursday are quite intense so, if I can, I treat Friday like Saturday. Pauline is going stir crazy. She's thrown away her crutches and is desperate for proper shopping, but she isn't ready yet. I took her to Burton because I knew she would get some gratification, but the signs were there from shop one. She missed out a couple of aisles. So I kept a close but surreptitious eye on her and when I judged she'd done enough I parked her and went and fetched the car. The sun came through and the Staffordshire countryside was beautiful. 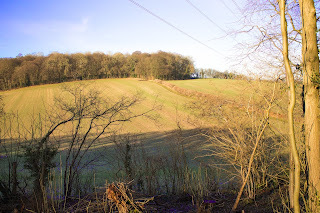 I hadn't got my Canon with me but I did have a pocket camera so I meandered back, heading up to Tattenhill and then following the back roads towards Lichfield. That took us through Dunstall and I showed the church to Pauline. When the weather is even better I will go back for a proper foray. I could see Pauline wilting so we went to The Hedgehog and I let them cook for us. It was a real success. Pauline was still raving about her meal hours afterwards, and I'd have mine again as well. Back home I walked up to the shops quickly, and regretted it. Christmas hasn't helped my fitness levels and I found myself panting up the steep part of the Old Burton Road. Time for the resolutions to kick in, especially about trying to keep fit. Heavy rain and a real bite to the wind. I processed two new listeners (we lose one for every three we gain) and then chatted to Paul over a cup of tea as Lisa arrived to cut everybody's hair. Rita had lunch with us. I took three to the Live at Home Scheme at Curborough, and then took Pauline and Rita to Tesco's for Rita's food shop. Pauline has now abandoned the crutches and they can go back to the hospital. I had recorded Stevenage this morning, downloaded all the magazines and was at the studio for 5.30pm. Our recording programme just would not load onto the computer and I lost 35 minutes. Whatever, we had a very full team and everybody pitched in and we were still done and dusted by 9,30, with 5 sacks ready for despatch in the morning. I never owned a camera until 1970. Born in wartime Britain with the austerity of rationing, raised by a single mom, you grew up never contemplating luxuries. Survival came first. But then I married and Robert came along. I had to capture his growing. I have only two photos of my own childhood and I wanted proper memories for our children. My first camera had a film that had to be developed. We were always broke in those days and so didn't waste shots. We've got albums of our early life as a family. Then things improved, I brought a proper camera, and then digital arrived and everything was different. Next came my automotive journalism and a camera became very important because I drove at least one new car every week and wanted pictures that weren't being used by everybody else. I also started this grand tour of Britain and began capturing the places we'd been and the sights we'd seen. I had an enormous collection, but made the mistake of not backing them up and so many shots I took were lost. Fortunately the memories can still be gleaned from the Internet because there were enough other people seeing what I was seeing, and many of them posted their shots on-line. However, I'd much rather use my own views and so I plan - if I am able - to return to as many of my favourite shots and do it all over again. That's why I have signed up for the Photoshop course run by the Shaw Academy. I'm hoping they will show me how to improve the shots I have still got (a few thousand) and make me a better photographer going forward. Pauline's leg is nearly mended and our 2016 Meanderings can shortly begin in earnest. Meanwhile, these are a few of my shots that I have tried to do something with. My favourites will come out as we reach their stories.